Food plants – Several understorey species produce berries or vegetative parts that represent an important and/or popular food for local people. Examples are the bluberries (Vaccinium myrtillus) and other dwarf Ericaceae growing diffusely in the boreal forests, or the wild Asparagus in the thermophilous deciduous forests of southern Europe. Ornamentals – Several understorey species are used as ornamentals Cyclamen or are wild relatives of cultivated varieties Viola Helleborus. Understorey species may also be involved in Carbon fixation and sequestration: The understorey contributes significantly to carbon sequestration, and can account for up to 5% of the net primary production of the forest. Source of nectar for pollinators and seeds/fruits for small mammals. Many species produces nectar-rich flowers that provide source of energy to a wide range of pollinators and seeds or fruits that serve as food for forest animals. An example are the seeds of species such as Viola that have a lipid-rich elaiosome for dispersal by ants. Decomposition and nutrient cycling. 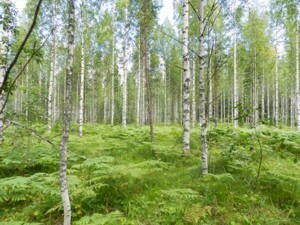 The herb layer contribute to up 15% of the foliar litter to the forest floor. Understorey litter has usually an elevated concentration of nutrients compared to trees (especially N and K). The rapid decomposition and high turnover rate of the herb-layer facilitates efficient recycling of nutrients in the forest soil. Tree regeneration. Understorey species may facilitate regeneration of tree species by positively influencing microclimatic conditions at the ground level and by sheltering (hiding) the seedlings against browsing by herbivores. Mechanisms of resistance to invasion by alien organisms. Understorey vegetation often includes highly adapted and competitive species that are likely to reduce the chances for alien, exotic species to establish in the community and become invaders. Habitat provision for a multitude of small mammals and insects. Establishing universal priorities among these services is very difficult, as the relative importance of each of them is strongly context-dependent. First, the region and type of ecosystem determines the pool of understorey species present, and the services provided are mostly species-specific. Secondly, the cultural and historical local contexts vary to the same extent as the type of forest ecosystem, so that a species that is not associated to a service in a given region may be considered of high interest in another region. Moreover, Hector & Bagchi (2007) and Isbell et al. (2011) indicated that different species promote different functions in different years, at different locations and under different environmental conditions. This promotes the precautionary principle of conserving maximum biodiversity in order to obtain long-term forest ecosystem stability and provisioning of ecosystem services. Trees have a species-specific impact on local environmental conditions: the mean amount, variability and nature of the light reaching the forest floor (Messier et al. 1998), soil water content via differences in throughfall, transpiration and water uptake by roots (e.g. Barbier et al. 2008, 2009; Geiβler et al. 2012), soil, nutrient availability and acidity via differences in litter quality and quantity, nitrogen fixation, nutrient uptake and atmospheric deposition on leaves and needles (e.g. Augusto et al. 2003; Hagen-Thorn et al. 2004), phytotoxic compounds, thickness litter layer (Rodríguez-Calcerrada et al. 2011). As a consequence of these tree species identity effects, the composition of the tree layer may substantially affect herb layer composition and productivity as the germination and performance of herb layer species depends on the environmental conditions (e.g. Ellenberg & Leuschner 2010).